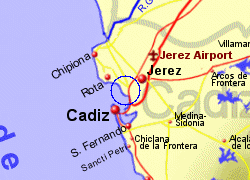 El Puerto de Santa Maria sits in the bay of Cadiz, lying on a line running from Cadiz to Jerez, built around the mouth of the River Guadalete. The outskirts of the town have not been designed to attract tourists but there is an attractive old town centre with cobbled streets lined with orange trees and typical Andalucian architecture. The town also has it's own beach, the Playa Puntillo. 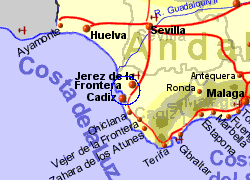 There is an old port, which used to be the main route for shipping sherry from Jerez, and a modern marina. Buildings of note include the 15th century Iglesia Mayor Prioral, and the 14th century Castle of San Marcos, declared a national monument in 1920, and which is a fortified church. 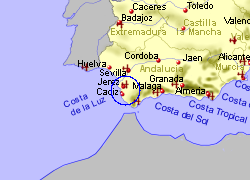 Map of the El Puerto de Santa Maria area.